Use this FREE detailed and color Infographic Poster to see at a glance HOW TO IMPLEMENT Common Core Mathematical Practice Standard – MP1 – “Making sense of problems and persevere in solving them”. 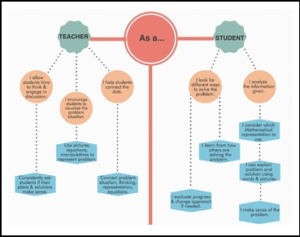 – How do teachers and students implement it? – What type of Math tasks should you use to implement it? – What kind of questions should you ask? Note: This is part 1 of an eight-part series. Follow us on http://preptoon.weebly.com/ to stay up to date with all the new Infographics we publish. Common Core Mathematical Practices by PrepToon is licensed under a Creative Commons Attribution-NonCommercial-NoDerivatives 4.0 International License. Based on a work at http://www.corestandards.org/Math/Practice/.